Beth Guenther of Koch Hazard Architects (Sioux Falls, SD) reports that construction is moving along smoothly at Ascension Lutheran Church. The project consisted of two parts: remodeling the Fellowship Hall and adding a new worship space (with related remodeling). 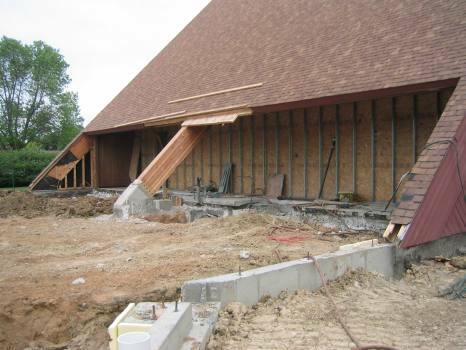 To date, the Fellowship Hall has been completed and the congregation has moved their worship services there so remodeling can be done in the existing worship space and construction of the new worship space can begin in earnest. This photo shows the footings and foundations in place for the new worship space, where it will join the existing worship space, which will be remodeling into a gathering space. The congregation is pleased with the process and product of our design efforts, and looks forward to their new worship space.